Books and Audio New MP3 downloads! 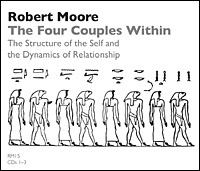 The four archetypal couples inherent in the Self—the King and Queen, the Warriors, the Magicians, the Lovers—create four distinct psychosocial environments within a relationship. The archetypal dynamics underlying both fulfillment and frustration in human relationships are examined, with particular focus on marital dynamics and sexual dysfunction. Theory and Discoveries · Men's Work / Men's Studies · Commentary and Interviews · Other Resources · Books and Audio New MP3 downloads! © 2019 Robert Moore, PhD All rights reserved.